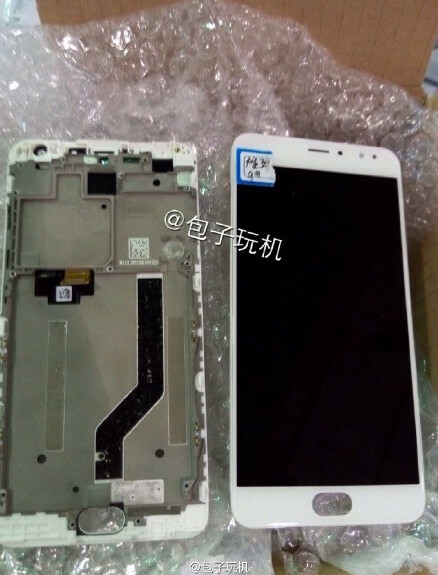 First image of Meizu NIUX leaks? Is this the the Meizu NIUX? On Tuesday, we told you about the Meizu NIUX. This is a code name for the manufacturer's next high-end device. As we also pointed out in a separate story, Meizu's president, Bai Yongxiang, confirmed a 1080 x 1920 resolution for the 5.5-inch screen on the phone. The executive also promised to use the best CPU available, which apparently is the Exynos 7420 SoC. Samsung's chipset will be powering this phone. Over on China's Weibo micro-blogging website, a picture was posted that is alleged to be the first image of the Meizu NIUX. The picture shows the phone with its front panel removed. The photo shows off an oval home button/fingerprint scanner. Other rumored specs include 3GB/4GB of RAM, 32GB of native storage, and a back to front camera combo of 21MP/5MP. Android 5.1 is pre-installed with Meizu's Flyme OS running on top. The phone is expected to be unveiled in October. Considering that Weibo is like the Wild, Wild West, we'd suggest taking this with the proverbial grain of salt. And that baby is biggest from its parents right ? No, please not again that ugly homebutton. Why do their phones have to look like Samsung phones?